"Robattles aren't just about the newest, most powerful Medabots, they're about courage and mind power—the soul of the Medafighter and Medabot combined." 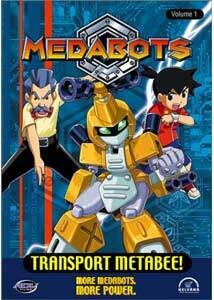 ADV brings the first of six discs in the Medabots series, based on the popular role playing game. This English language version was produced by Nelvana, the company responsible for bringing over Cardcaptors, and premiered on Fox Kids September 1, 2001. As one would expect from a game port, so far this falls into the "Robattle of the week" category as far as plot development goes, but there is a glimmer of underlying story arc showing through, as we are introduced to the concept of the Medabot and the characters in the show. Set in the year 2122, kids have pet robots called Medabots, which are modular in design, and use a specialized "medal" as their intelligence and specialty core. The owners, referred to as Medafighters, engage in one-on-one Robattles, with the victors claiming a piece of gear, (a Medapart) from the losing opponent. Ten-year-old Ikki dreams of owning a Medabot, and representing his country at the World Robattle Tournament. It is every kid's dream to be a master Medafighter, but the machines aren't cheap. When Ikki discovers a rare Medal, he scrapes together enough money to buy an old Medabot of his own. The other kids laugh at his antiquated hardware, which he names Metabee, until the robot earns respect by beating some formidable opponents. Metabee isn't quite your average Medabot, and doesn't take kindly to being anyone's property, causing Ikki no end of grief. He also has to contend with a gang of kids who call themselves The Screws, who have taken over the school's Student Council room by winning Robattles, and another group of heavy metal Medafighters who are snatching up Medaparts from their victims in unfair competition. Ikki has to learn what it takes to become a champion, and try to get along with Metabee in the process. As each Medabot is introduced, we get a rundown on its specialties and Medapart configuration, and of course these have merchandising tie-ins to a complete line of Hasbro products. Kids should find the show entertaining, but older folks may find it a bit tedious. It wasn't as bad as I had expected, but I don't think I would be choosing this over other options for personal viewing. There is a good deal of humor, and lots of action. The story has been fair so far, and not too repetitive despite the formula. As long as you are willing to shell out for the collectables, Medabots should please the younger crowd. Image Transfer Review: Image quality is clean, with solid, if not overly vibrant, colors and good black level and shadow detail. Grain is light, there is a bit of ringing on edges, but aliasing is fairly light, and compression artifacts are minor. Not a standout, but nothing to complain about. Audio Transfer Review: Audio is available in an English dub only, which is clean with no distortion or hiss noted. Dialogue is easily discernable. Directionality is limited, primarily to the score, with most dialogue being center focused. 6 Other Trailer(s) featuring Monster Rancher, Power Stone, Sonic the Hedgehog, Nadia, Secret of Blue Water, Tekken: The Motion Picture, Arc the Lad. Extras Review: First are descriptions providing details for the main players and anciliary characters. Next is a Medabot A-Z, with specs for 16 different robots, each with their Medal type, body, Medafighter and special attacks listed. Trailers for Monster Rancher, Power Stone, Sonic the Hedgehog, Nadia, Secret of Blue Water, Tekken: The Motion Picture and Arc the Lad are also included. The insert has the specs for Metabee. A fun, though fairly clich� series so far, where the boy has to best his rivals to obtain Medaparts for his robot. While this should appeal to younger viewers, character depth isn't quite established yet. I may be over analyzing here, but I would want to instill a bit of parental guidance to the message that it is just to take the spoils from those weaker than you. This disc contains five episodes.